The detached cottage which has all modern amenities is situated in the North Cornish village of ST Tudy. There are 2 comfortable bedrooms one with a 5ft double bed and one with twin beds, a smaller bedroom with two bunk beds each 6ft 6 ins long and 2ft 6ins wide . There is background heating in every room, a multi-fuel stove in the sitting room and a an open fire in the dinning room. There are two purpose built fire guards There is a colour TV, a DVD player, music centre, a washing machine/dryer, fridge/freezer, microwave oven, dishwasher, and an automatic electric cooker with 2 ovens. Additionally there are 2 toilets, a bathroom and a shower room. There is a stainless steel sink and washing machine/dryer. Free Wi-Fi is available.Outside there is a spacious patio with a built in barbecue and an enclosed child-friendly secure garden. Enjoy a drink in the evening in the garden whilst watching the sun go down. There is ample parking for several cars outside the front of the cottage. We regret there is a no pets or smoking policy at the cottage. The property is halfway between Bodmin Moor and the sea. It is ideally situated for walking/cycling and visiting Rock, Padstow and North Cornwall's many other attractions. The Camel trail is two miles away and is a disused railway line ideal for cycling, You can hire bicycles in Wadebridge which is at the start of the Camel estuary. The estuary itself is often home to dolphins. Details are on the cottage notice board. The Eden Project, the 8th wonder of the world, Pencarow historic house and gardens, and many of the beautiful gardens of Cornwall are within easy reach. The well stocked village village shop is 600 yards away. Pick your own strawberries and raspberries at Pencarrow only five minutes away and then buy your Cornish clotted cream in the shop and have a cream tea on the patio. Stroll round to the village pub which is excellent and have a drink or some food. There is virtually no traffic on the way to the pub 650 yards away. The nearest beach is 35 minutes away, while the South Coast beaches can be reached in less than 1 hour. This property is not only perfect for summer holidays but is cosy and warm at Christmas and/or half term holidays. It is well suited for families. I am a retired civil aircraft engineer, design and build, I was trained as an apprentice (6years) before going to Imperial college. I worked as an aircraft engineer for 40 years. The first aeroplane I worked on as gualified engineer was Concorde. I have managed all the improvements to this beautiful Grade 2 listed cottage 1733. All the work has been carried out to the highest standard. 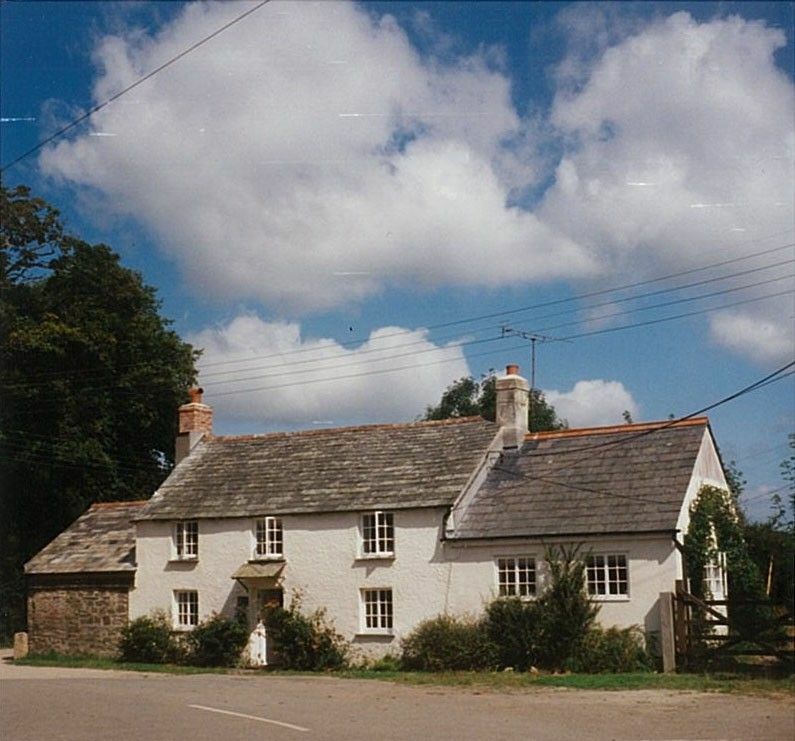 The beautiful cottage is a old building with modern facilities. It is about 300 years old and is situated in a beautiful part of Cornwall that I have known for over 50 years. The village is lovely and the villagers very friendly. My wife and I found the cottage by accident while looking for somewhere to holiday. On entering the cottage it immediately felt friendly. and warm.The walls are over 2 feet 6 inches thick, cool in the summer and warm in the winter. We were meant to own this cottage. Both bath rooms have heaters and heated towel rails. There is a shaver point, a large mirror with a light, in the shower room and a stainless steel sink with a washing machine/dryer. The automatic electric cooker has two ovens. There is a food processor, and mixer etc in fact a well equiped kitchen. Large garden children safe. THIS IS A HOME FOR A HOLIDAY NOT A HOLIDAY HOME. Wi-Fi available from. Fantastic time and would happily return. Spotlessly clean. Lots of helpful advice inside about local amenities as well as how things in the cottage worked. Quiet setting with a beautiful garden. A very comfortable, well located cottage. Very well thought out with regard to customers needs. The cottage was lovely - the owners have really thought about what people require to be comfortable and enjoy their time there. Delightful garden - safe for children and very nice to discover herbs dotted about. Very comfortable beds, plenty of hot water, well stocked kitchen and facilities. And appreciated arriving to a bottle of wine after our long drive! Fabulous park across the road - the grandchildren enjoyed that. Good location, nice village. A little more information about local attractions would have been helpful, although leaflets are readily available everywhere you go. We all enjoyed staying in this cottage, and are likely to go again. Post-Christmas break in St Tudy. We had a lovely break at School View Cottage in the delightful village of St Tudy. The cottage is spacious with two sitting areas . It is cosy,comfortable and thoughtfully equipped. Some of the furnishings are a little dated but that didn't detract from generally cosy feel of the cottage. The weather outside was miserable for much of our stay but we were very cosy in front of the roaring fires. The village is friendly and the excellent local pub/restaurant just a short walk away. St Tudy is well located for the North Cornwall coast and for walking on Bodmin Moor.We would definitely recommmend School View Cottage. What a wonderful cottage. Edward and Marion's attention to detail was outstanding, and the wine and milk provided were a lovely touch, and much appreciated. Very pleased with the accommodation. There is a field opposite with a playground so great for kids to run around in. We had a great holiday, the pub down the road was fantastic. Hopefully we will come back and stay another time. We have stayed at School View on quite a few occasions over the years and love it! A beautiful well equipped cottage in a lovely peaceful friendly village- great base for exploring North Cornwall. A welcome addition of the new double bed in the main bedroom which we found very comfortable! The wine and milk in the fridge was appreciated! Had a great week and hope to be back again soon. School View is located in the picturesque village of St Tudy (website sttudy.org.uk). It is close to the dramatic North Cornwall coast and its fantastic beaches. Hengar Manor a country club open to non members is less than a mile away. Facilities include swimming pool, tennis courts, nine hole pitch and putt, restaurants and bars. The well stocked village shop and pub are 1000 and 200yds away respectively. The pub serves excellent food. For surf lovers Polzeath, Newquay both have championship surf, and Bude are a short drive away. Daymer bay is ideal for the bucket and spade brigade 20 - 25 minutes away.. If you are a golfer, near by St Enodoc has 2 courses the short course you don't need a handicap certificate , Bowood,and St Kew offer challenging 18 hole courses 10 to 15 minutes away. For a day out you can always drive down to the stunning Helegan gardens, the Eden project or the Tate gallery. Most of Cornwalls great gardens are within easy reach. The south coast is less than an HOUR away.